Specialised manufacturer, exporter and supplier of Air Shaft from India. Differential Shaft is a sophisticated winding shaft for slitter rewinder machine, used as duplex shaft winder (centre winding type). It is capable of compensating speed variation due to gauge variation with multi cores. Minimum 20 mm core width is possible. Reel holding is possible at any position across the width. No-time lost in re-positioning cores since no distance pieces are required. Shaft can run at very high speed. This shaft consists of slotted shaft, rubber bladders, hard and ground steel cage with ball type gripper. This is a lug type shaft but core holding is initiated mechanically and not pneumatically. 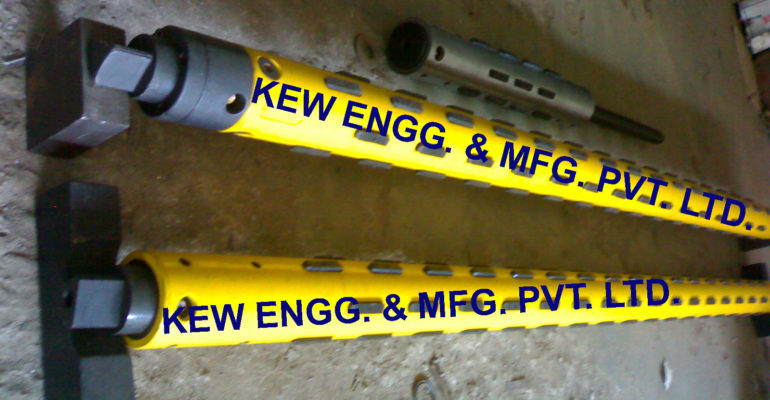 This shaft mainly consists of slotted pipe, steel lugs, brass cam, ratchet etc. The shaft is capable of taking any challenge arising out of heavy load and speed. It is possible only because of positive gripping and core centering achieved without any extra efforts with the help of cam/lug design. It is very much advantageous with cores having uneven inside diameter. Key and alien-cap bolt prevent any shearing of journals – pipe assembly. we also manufacturer all type of Air Shafts like, , mechanical shaft, quick look shaft, multi tube shaft, leaf type air expandable shaft, lug shaft, ball shaft, mechanical expanding shaft, bottom knife holding shaft, multi bladder shaft, spare parts of air shaft, differential shaft, clutch shaft and many more. Economic model for Re-winder shaft having all the advantages like slippage, accommodating gauge variation, smaller core width etc. With only limitation of time needed for repositioning of the core. This shaft is suitable for Paper Cores. Individual Quick Locks are also available having width of 50 mm, 75 mm, 100 mm and 300 mm. The bore of Quick Lock is tailor made. This is a very commonly used shaft. It mainly consists of slotted pipe, journals to suite users machine, lugs, rubber bladder and non-return valve. These types of shafts are suitable for both unwinding and winding stages. It can accommodate single core, multi cores of the width more than 150 mm. Type of pipe material, lug material are decided based on duty conditions like load, speed and core material. The limitations are, it cannot take care of gauge variation or individual core speed variation since slippage is not achieved and core width less than 1 50 mm. This type of shaft mainly consists of slotted base pipe, metal leaves with knurling/serration, rubber bladder, non-return valve and suitable journals. This also has a limitation to accommodate gauge and speed variation. Grippers are slit through the metal pipe & pneumatic bladder is used for inflating. The grippers give positive holding of the core. A Shaft specially designed for slitters to handle constant tension on multiple slit. The base steel shaft has multiple bladders, mounted with Ball Locks for reel holding. > Small width winging possible at very low web tension -A solution for Sensitive Material. > Each slit material can slip at different speed and same tension. > Ball lock with spring design minimizing side movement while setting and running. > Automatic tension controlling through rotary union in dynamic condition by signals from machine drive. Mechanical Expanding ShaftExternally Lug Type Expanding Shaft with Wedge type design makes it possible for concentric holding and allow high speed winding. > Heavy spring is applied for ensuring sliding back of lugs. > True mechanical advantage is used in achieving heavy clamping force. > Absolutely maintenance free as no rubber components or lubrication. Fundamentally a Multi Bladder Shaft with tight-tolerance. External body which holding anvils or knives precisely in place for slitting operations. The Multi Bladder Shaft is made of Aluminum Extrusion with steel journals shrink-fitted for High Torque capability. It is assembled with a PU tube for longevity. > Multi bladder is very light and allows easy handling. > Easy and quick in-house maintenance. > One can mount core of any width as small as 4mm for slitter rewind. > Grapples can be offered as per holding requirements. > I.E. rubbers, Engineering Plastic and aluminum. > We offer one piece steel Body for heavy torque.